DEVON inventor who claims he has found a cure for crippling diseases has been snubbed by medical experts. 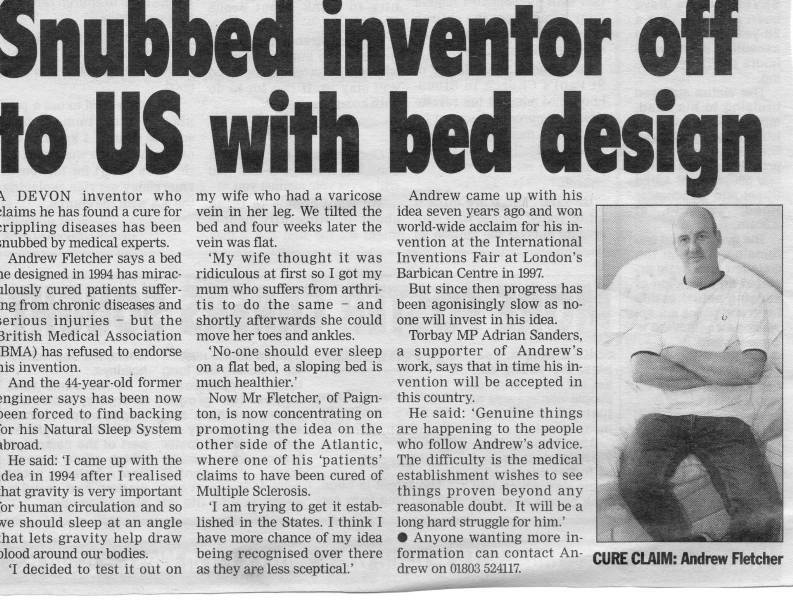 Andrew Fletcher says a bed he designed in 1994 has miraculously cured patients sufferng from chronic diseases and serious injuries - but the British Medical Association BMA) has refused to endorse his invention. And the 44-year-old former engineer says has been now been forced to find backing or his Natural Sleep System abroad. He said: 'I came up with the idea in 1994 after I realised hat gravity is very important or human circulation and so we should sleep at an angle hat lets gravity help draw blood around our bodies. 'I decided to test it out on my wife who had a varicose vein in her leg. We tilted the bed and four weeks later the vein was flat. 'My wife thought it was ridiculous at first so I got my mum who suffers from arthritis to do the same - and shortly afterwards she could move her toes and ankles. Now Mr Fletcher, of Paignton, is now concentrating on promoting the idea on the other side of the Atlantic, where one of his 'patients' claims to have been cured of Multiple Sclerosis. Andrew came up with his idea seven years ago and won world-wide acclaim for his invention at the International Inventions Fair at London's Barbican Centre in 1997. But since then progress has been agonisingly slow as no-one will invest in his idea. Torbay MP Adrian Sanders, a supporter of Andrew's work, says that in time his invention will be accepted in this country.